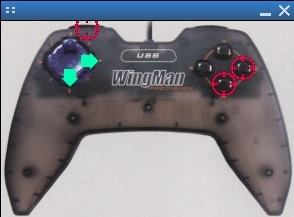 This is sdl_wingman, a super-simple application demonstrating how to use joysticks under SDL. Made in 2 days, it certainly isn't the best code in the world, but it seems to work and hasn't crashed yet! If you have a Logitech USB Wingman Precision, you're in luck! If you don't, you get to see what buttons match up to the buttons on a Logitech USB Wingman Precision! Which may not be all that useful but nothing's stopping you from putting in your own image and set of button coordinates. Send comments, patches, ports etc to Tyler Montbriand, monttyle@heavyspace.ca.